Even though I enjoy my mini baked donuts, they are no substitute for the fried yeasty doughy taste of regular doughnuts. 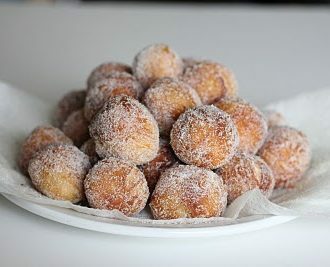 I’ve been reluctant to try to make my own fried doughnuts as I don’t like working with yeast and I don’t like frying things. I found a recipe a while back that uses Pillsbury biscuit dough as a shortcut for creating doughnuts. You still have to fry it, but you don’t have to make the dough. After my success with steaming Pillsbury dough to make chinese bao, I was curious to try frying the dough to create doughnuts. I used Grands biscuit dough. I used a round cookie cutter to make a hole in the middle, creating a doughnut shape. With the leftover dough, I rolled it up into balls, creating doughnut holes along with my doughnut rings. With my second batch of dough, I chose to make donut holes only. I divided each dough piece into three smaller pieces and rolled them into balls. I don’t like to fry things because I’m always afraid of getting burned and sprayed with the hot oil. Surprisingly, these were really easy to fry. There was no splashing or loud bubbling of oil. Instead, the dough quietly sizzled and bubbled when it hit the oil and it cooked really fast. It made the frying fairly painless and easy. The end result was pretty good. Since you are working with biscuit dough, they do taste a bit buttery and salty. However, after rolling them in sugar, they tasted like doughnuts. The dough is fluffy and yeasty. These reminded me of the fried doughnuts often served at the Chinese buffets. These were so easy and quick to make and they satisfied my doughnut fix. I’m definitely going to try making these again. Next time, I think I’ll add some pretty glazes instead of just rolling them in sugar. like you would a doughnut. sides. Drain briefly on wire racks placed over baking sheets. Place the sugar in a bowl and roll the hot doughnuts in the sugar. Sometimes there's no substitute for fried yeast donuts so when I get a craving I skip making the dough from scratch and use store-bought biscuit dough instead. In a large pot or deep fryer, heat the oil to 375°F (190°C). Place the sugar in a shallow bowl. Separate the biscuits and lay them flat on a work surface. Cut a circle out of each center, using a round cookie cutter, so the biscuits look like donuts. You can roll the circles you cut out into balls to make donut holes. Carefully transfer the donuts, working in batches if needed, to the hot oil and fry them until they are golden brown on each side. Transfer the fried donuts to a wire rack placed over a sheet pan to drain. While the donuts are still hot, coat them in the sugar on both sides and serve. If you want to make a batch of donut holes only, divide each biscuit into three parts and roll each into a ball. You will end up with 24 donut holes. Yummy! I saw this being done by Guy Fieri from the Food Network. He used the same dough i think and made cinnamon sugar donut holes. How do you ck the temp of the oil? I don’t have a deep fryer contraption. I usually just use an old pot or something. How many donuts were you able to make from the one can of dough? 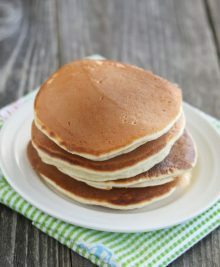 Hi Faye- You can make these with a cinnamon sugar mix too; I thought of doing that. Well the Grands biscuits are already separated into eight parts. So I just took the precut biscuits, and made eight donuts and eight donut holes. For the temp, I actually recently bought a candy/frying thermometer and stuck it onto my pot. I don’t have a special fryer either. They are pretty cheap. But if you don’t want one, you can just kind of test it out. As soon as the oil gets hot, you can put one in and see if it fries properly. If it’s not frying, then turn your temp up. If it’s getting dark brown or burning, turn the temp down. These things are actually pretty good! They fry VERY FAST on each side so keep your eye on them at all times. Thank You Kirbie for the recipe..it was all too easy…and I thought making butterball cookies were easy. Maybe next time I’ll make some homemade donut frosting for that “homemade frosted donut” feeling. So glad you like them! Who knew biscuit dough was so versatile! i just saw a local chinese takeout use exact same dough. it kind of turned me off b/c once i know how something is made, i dont care for it. (and i was charged almost $3 for just 10 pieces that she split up directly from the can and threw each piece in the deep fryer….definitely a turn-off LOL). it wasnt bad at all and i really like the texture (golden yummy outside and chewy inside). never thought biscuit dough can become donut dough. lol thanks for sharing! Yeah it tastes just like regular donut holes. I don’t even really taste the butter that’s in the biscuit dough. I remember making these back in the 60’s after I heard about them at a Homemakers Club meeting. My guess it was a Pillsbury Bake Off winner. Good then, good now and best of all easy. Interesting. I’ll have to try that next time. Made these in girl scouts. Now make them for my kids. Take grands, roll them out (to your size) and cut out the middle. I don’t fry much of anything. I bake them! Same recipe. My kids love these! 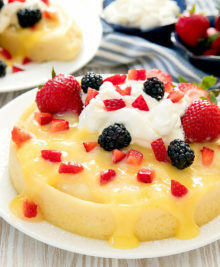 Top with some fresh fruit and whipped cream, you will want this every day!! Thanks for sharing your variation. And you can leave the URL blank. It’s basically for if you are a blogger and want to share the link to your website. I don’t know my URL. How do I find that out? Who knows their URL? I don’t even know what that stands for. How do I find that out? what kind of oil is best to use? You can use just about any. I usually use vegetable oil because it’s what I have on hand. 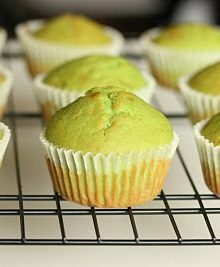 I tried making these but the inside is not fully cooked yet. Its almost burnt already and the inside is not cooked yet. Did I do something wrong? I’m not sure. the dough should cook very easily. this is a popular way to make donuts. your oil might be too hot if your outside is burning. I suggest you lower the oil temperature and also maybe make smaller balls so that there is less to cook. My dad used to make these on weekends. It brings back memories. Thanks for reminding me. Going to make these this morning and start the memories with my kids.